This lease form is designed for a single tenant build to suit transaction, where the landlord builds the entire premises for the tenant. The rent payable by the tenant is pegged to the total construction and financing costs of the project, and it is then subject to percentage increases in specified years. Renewal options are at Fair Market Rentals. The document contains extensive provisions concerning construction of premises, including the preparation of improvement plans, cost estimates, final pricing, tenant improvements, change orders, building shell costs, landlord overhead and profit, punchlist items and parking lot improvements. After completion of construction, the tenant maintains the entire building and tenant improvements, except for structural elements and roof membrane replacement, which is the responsibility of the landlord. 1. ZONING. Landlord represents and warrants to Tenant that, as of the Commencement Date, (i) the premises are in compliance with all municipal, county, state and federal statutes, laws, ordinances, including zoning ordinances, and regulations governing and relating to the Building Shell; (ii) there shall exist no patent or, to the best of Landlord’s knowledge, latent defect in the Premises; and (iii) the Premises shall be in good condition and repair and fit for Tenant’s particular purposes. Landlord represents and warrants to Tenant that, as of the Commencement Date, the land is zoned: _____________________. A ______ acre parcel (“Parcel”) on the ______ side of ____________________, including all appurtenances and buildings now or during the Term located thereon. Pursuant to the terms of this Lease, Landlord is obligated to construct a single story building of approximately _______ rentable square feet (“Building”), a parking lot consisting of a minimum of ______ parking spaces expandable to approximately __________ spaces described as Building _____ on Exhibit “A” attached hereto. Landlord represents and warrants that Landlord is the fee simple owner of the Premises. Prior to the Commencement Date, Landlord shall use its best efforts to record a parcel map to subdivide the Parcel into two parcels, one for the Premises and the balance for a second building to be constructed for Tenant pursuant to that certain lease between the parties of even date herewith. 3. USE: Tenant shall use the Premises only for the following purposes and shall not change the use of the Premises without the prior written consent of Landlord, which consent shall not be unreasonably withheld or delayed: Office research, development, testing, manufacturing, ancillary warehouse, and other legal uses. Landlord makes no representation or warranty that any specific use of the Premises desired by Tenant is permitted pursuant to any Laws. 4. TERM AND RENTAL: The term (“Lease Term”) shall be for one hundred twenty (120) months, commencing on the date on which the Building Shell and Tenant Improvements are Substantially Complete as defined in Article 7.H below (“Commencement Date”), and ending one hundred twenty (120) months thereafter, (“Expiration Date”). In addition to all other sums payable by Tenant under this Lease, Tenant shall pay as base monthly rent (“Base Monthly Rent”) below for the Premises in an amount determined pursuant to Exhibit “B” attached hereto. Base Monthly Rent shall increase at the end of the ________ and ________ month of the Lease Term by the product of the Base Monthly Rent payable for the preceding month multiplied by ___________. (_____). The parties agree to enter into an amendment to this Lease setting forth the exact amount of the Base Monthly Rent payable during the Lease Term within fourteen (14) days following determination by Landlord. Base Monthly Rent shall be due on or before the first day of each calendar month during Lease Term. All sums payable by Tenant under this Lease shall be paid in lawful money of the United States of America, without offset or deduction, and shall be paid to Landlord at such place or places as may be designated from time to time by Landlord. Base Monthly Rent for any period less than a calendar month shall be a pro rata portion of the monthly installment. A. Adjustment for Variance in Building Square Footage: In the event the square footage of the Building is other than ______ determined by measurement after completion of construction, within thirty (30) days after the Commencement Date, Landlord and Tenant shall execute an amendment to the Lease setting forth the actual rentable square feet of the Building, which calculation shall be consistent with the BOMA standard for Industrial Buildings (i.e. outside of outside wall to outside of outside wall without deduction). 5. SECURITY DEPOSIT: None required. 6. LATE CHARGES: Tenant hereby acknowledges that late payment by Tenant to Landlord of Base Monthly Rent and other sums due hereunder will cause Landlord to incur costs not contemplated by this Lease, the exact amount of which will be extremely difficult to ascertain. Such costs include, but are not limited to, administrative, processing, accounting charges, and late charges, which may be imposed on Landlord by the terms of any contract, revolving credit, mortgage or trust deed covering the Premises. Accordingly, if any installment of Base Monthly Rent or any other sum due from Tenant shall not be received by Landlord or Landlord’s designee within ten (10) days after Tenant’s receipt of written notice from Landlord that such amount is delinquent, Tenant shall pay to Landlord a late charge equal to five (5%) percent of such overdue amount which late charge shall be due and payable with the payment then delinquent. The parties hereby agree that such late charge represents a fair and reasonable estimate of the costs Landlord will incur by reason of late payment by Tenant. Acceptance of such late charge by Landlord shall in no event constitute a waiver of Tenant’s default with respect to such overdue amount, nor prevent Landlord from exercising any of the other rights and remedies granted hereunder. A. Building Shell Construction. Landlord shall cause the shell of the Building (“Building Shell”) to be constructed by independent contractor to be employed by and under the supervision of Landlord, in accordance with the building shell plans prepared by _____________ (“Tenant’s Architect”) and approved by Landlord and Tenant and guideline specifications, which are attached hereto as Exhibit “C” and are incorporated herein by this reference (“Shell Plans and Specifications”). Landlord shall construct the Building Shell in accordance with all applicable municipal, local, state and federal laws, statutes, rules, regulations and ordinances. Landlord shall pay for all costs and expenses associated with the construction of the Building Shell up to a maximum amount of ______________________ and No/100 Dollars ($________) (“Building Shell Allowance”). The Building Shell shall include all items customarily included within the definition of a speculative “building shell,” including without limitation, those items set forth in the Building Shell Definition, attached hereto as Exhibit “D”, and incorporated herein by this reference. Landlord shall provide Tenant half-size vellum as-built drawings of the Building Shell within thirty (30) days following completion of construction thereof. B. Tenant Improvement Plans. Tenant, at Tenant’s sole cost and expense, has also hired Tenant’s Architect, to prepare plans and outline specifications. (“Tenant Improvement Plans and Specifications”) which are attached hereto as Exhibit “E” with respect to the construction of improvements to the interior premises (“Tenant Improvements”). The Tenant Improvements shall consist of all those items not included within in the scope of the Building Shell definition pursuant to Article 7.A above and Exhibit “D” . The Tenant Improvement Plans and Specifications shall be prepared in sufficient detail to allow Landlord to construct the Tenant Improvements. Landlord shall construct the Tenant Improvements in accordance with all Tenant Improvement Plans and Specifications. Tenant shall pay for all costs and expenses associated with the construction of the Tenant Improvements. i. Building Shell. Within fourteen (14) days after Tenant’s delivery of the Shell Plans and Specifications as Landlord, Landlord shall deliver to Tenant a preliminary cost estimate of the cost to construct the Building Shell. The preliminary cost estimate shall contain sufficient detail for Tenant to understand the cost element of each portion of the proposed Building Shell. ii. Tenant Improvements. Within fourteen (14) days after Tenant’s delivery of the Tenant Improvement Plans and Specifications to Landlord, Landlord shall also deliver to Tenant a preliminary cost estimate of the cost to construct the Tenant Improvements. The preliminary cost estimate shall contain sufficient detail for Tenant to understand the cost element of each portion of the proposed Tenant Improvements. i. Building Shell. Within ten (10) days after Tenant’s approval of the preliminary cost estimate for the Building Shell, Landlord shall submit to Tenant competitive bids from a minimum of three (3) subcontractors for each aspect of the work which is to be performed. Landlord must utilize the low bid in each case, unless Tenant approves Landlord’s use of another subcontractor, and the cost of the Building Shell shall be based upon construction expenses equal to the sum of the bid amounts as approved by Tenant. Upon Tenant’s written approval of the contract bids, Landlord and Tenant shall each be deemed to have given their approval of the final Shell Plans and Specifications on which the cost estimate was made, and Landlord shall proceed with the construction of the Building Shell in accordance with the terms of Article 7.H below. If Tenant does not specifically approve or disapprove the bids within seven (7) days, Tenant shall be deemed to have approved the bids. ii. Tenant Improvements. Within ten (10) days after Tenant’s approval of the preliminary cost estimate for the Tenant Improvements, Landlord shall submit to Tenant competitive bids from a minimum of three (3) subcontractors for each aspect of the work which is to be performed. Landlord must utilize the low bid in each case, unless Tenant approves Landlord’s use of another subcontractor, and the cost of the Tenant Improvements shall be based upon construction expenses equal to the sum of the bid amounts as approved by Tenant. Upon Tenant’s written approval of the contract bids, Landlord and Tenant shall each be deemed to have given their approval of the final Tenant Improvement Plans and Specifications on which the cost estimate was made, and Landlord shall proceed with the construction of the Tenant Improvements in accordance with the terms of Article 7.H below. If Tenant does not specifically approve or disapprove the bids within seven (7) days, Tenant shall be deemed to have approved the bids. E. Change Orders. Tenant shall have the right to order changes in the manner and type of construction of the Building Shell or the Tenant Improvements. Any change orders which are submitted by Tenant after the date which is ten (10) days after the issuance by the City of _________ of a building permit for the construction of the Building Shell, which cause Landlord’s construction schedule to be delayed shall cause the Commencement Date to occur one (1) day in advance of the date the Building Shell is Substantially Complete, as defined in Article 7.H, for each day of delay. Upon request and prior to Tenant’s submitting any binding change order, Landlord shall promptly provide Tenant with written statements of the cost to implement and the time delay and increased construction costs associated with any proposed change order, which statements shall be binding on Landlord. If no time delay or increased construction cost amount is noted on the written statement, the parties agree that there shall be no adjustment to the construction cost or the Commencement Date associated with such change order. If ordered by Tenant, Landlord shall implement such change order, and the cost of constructing the Tenant Improvements shall be increased in accordance with the cost statement previously delivered by Landlord to Tenant for any such change order. F. Building Shell Costs. Landlord shall pay all costs associated with the Building Shell. The costs of the Building Shell shall consist of only the following costs to the extent actually incurred by Landlord in connection with the construction of the Building Shell: costs of construction, costs of permits, and the general contractor overhead described in Article 7.J below. During the course of construction of the Building Shell, Landlord may deliver to Tenant not more than once each calendar month a written request for payment which shall include and be accompanied by: (i) Landlord’s certified statements setting forth the amount requested certifying the percentage of completion of each item for which reimbursement is requested and certifying that the progress payment requested is due to a subcontractor of Landlord pursuant to a contract between Landlord and Landlord’s subcontractor. 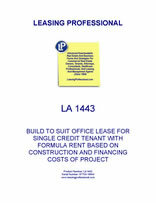 Tenant shall pay to Landlord, within fifteen (15) days after Tenant’s receipt of the above items, any costs incurred by Landlord in excess of the Building Shell Allowance in connection with the Building Shell in accordance with the Shell Plans and Specifications minus the retainage set forth below. Tenant shall be entitled to retain ten percent (10%) of the amount invoiced by Landlord until the Building Shell is “Substantially Complete” (defined in Article 7.H below). Tenant shall pay the retained balance owing to Landlord within fifteen (15) days following the date that the Building Shell is Substantially Complete. All costs for Building Shell shall be fully documented to and verified by Tenant. The amounts charged to Tenant shall be limited as provided in Article 7 .D.i above. G. Tenant Improvement Costs. The costs of the Tenant Improvements shall consist of only the following costs to the extent actually incurred by Landlord in connection with the construction of the Tenant Improvements: costs of construction, costs of permits, and the Landlord overhead described in Article 7.J below. During the course of construction of the Tenant Improvements, Landlord may deliver to Tenant not more than once each calendar month a written request for payment which shall include and be accompanied by: (i) Landlord’s certified statements setting forth the amount requested certifying the percentage of completion of each item for which reimbursement is requested and certifying that the progress payment requested is due to a subcontractor of Landlord pursuant to a contract between Landlord and Landlord’s subcontractor. Tenant shall pay to Landlord, within fifteen (15) days after Tenant’s receipt of the above items, the costs incurred by Landlord in connection with the Tenant Improvements installed in the Building in accordance with the Tenant Improvement Plans and Specifications minus the retainage set forth below. Tenant shall be entitled to retain ten percent (10%) of the amount invoiced by Landlord until the Tenant Improvements are “Substantially Complete” (defined in Article 7.H below). Tenant shall pay the retained balance owing to Landlord within fifteen (15) days following the date that the Tenant Improvements are Substantially Complete. All costs for Tenant Improvements shall be fully documented to and verified by Tenant. The amounts charged to Tenant shall be limited as provided in Article 7.D.ii above.